Once again our Spring Garden Show was very successful last month despite the rather chilly weather which persisted! We had some nice, new stands this year and the exhibitors were very pleased. There were a record number of plant sales and we had good attendance across all 3 days with a lovely atmosphere. The month of May has crept up on us and the weather is starting to pick up thank goodness – the Wisteria, lilac in colour, is now in full bloom climbing over the wall leading into our Walled Gardens, flanked by a border of purple irises which are just starting to blossom. Together this is a spectacular display and well worth a visit to our Gardens to enjoy while it lasts. This is a busy time of year for Burney our Head Gardener and his team who work tirelessly to keep everything looking their best. At the moment their main task is taking up the bedding plants and replacing with annuals. The vibrant colours in the Wild Flower garden are particularly eye-catching at the moment with the blue forget-me-nots contrasting alongside the yellow euphorbia and next door in the Herb garden the purple alliums are beginning to burst into bloom. Next month the roses will start to come out in the Rose Garden so watch this space… Definitely worth a visit! There is also the opportunity to buy tickets for a Talk with Alan Titchmarsh on Tuesday 14th June organized by NCG Plant Heritage who are based on the Loseley Estate. Full details of this Event are available on our website. 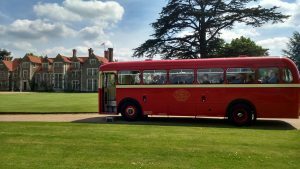 The Events team are also busy as the Summer season gets underway with our many visitors and groups coming to enjoy tours of Loseley House and our beautiful Gardens. 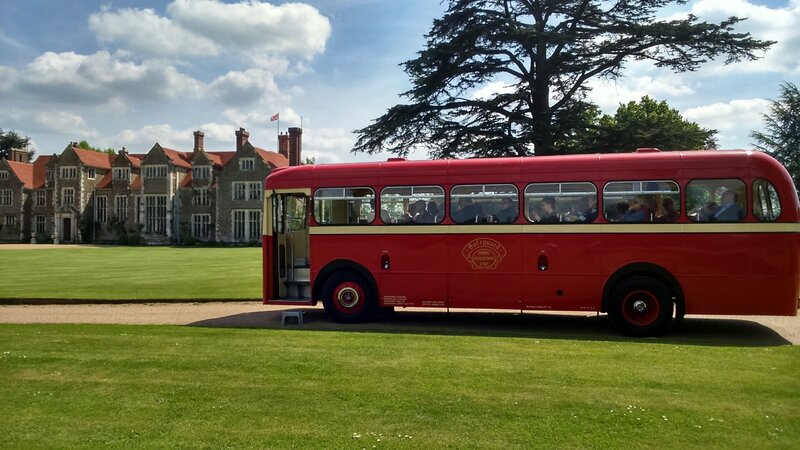 We recently organized a very successful Familiarisation visit with around 20 Tour operators who travelled by Vintage bus to enjoy seeing a wide array of diverse Venues which Surrey has to offer including Loseley Park. In addition there are corporate functions and charity events taking place and couples getting married who are able to enjoy exclusive use of our beautiful Venue on Fridays and Saturdays in the Summer months. 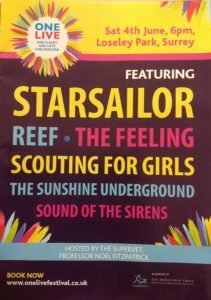 We are very excited t hat the One Live Concert is taking place at Loseley Park on Saturday 4th June hosted by Channel 4’s Supervet, Professor Noel Fitzpatrick. It promises to be a night to remember with brilliant Bands including Starsailor, Reef & Scouting for Girls to name a few. Details for purchasing tickets are on our website so hurry up and get yours now. We’ve got ours! I can’t believe I am now in my 12th year working at Loseley Park, I don’t know where the years have gone but I do know it is a really lovely place to work. Why don’t you come and visit us and see for yourself just how special Loseley Park is. Opening times are on our website and we look forward to welcoming you.